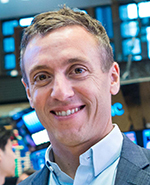 Jamie Wise is the Founder of BUZZ Indexes and the President and Chief Executive Officer of Periscope Capital, a Toronto-based hedge fund manager. BUZZ Indexes creates and maintains proprietary quantitative index and portfolio strategies based on Big Data analytics models. Established in 2009, Periscope Capital is an alternative investment asset manager focused on cross-asset arbitrage strategies. Previously, Mr. Wise was a managing director at Moore Capital Advisors Canada, a multi-strategy Canadian-focused hedge fund. Prior to Moore Capital, Mr. Wise was a Managing Director and Portfolio Manager at the Bank of Montreal where he led an internal proprietary trading group. At BMO, Mr. Wise was appointed the youngest Managing Director in the firm's history. Mr. Wise has an undergraduate business degree (hons. ), graduating first in his class from the Ivey School of Business at the University of Western Ontario in 1998. Mr. Wise holds a Chartered Financial Analyst (CFA) designation.